Sheri Autry was born a designer. By age 10, she was designing and sewing dresses, tops, and pajamas for herself and her younger sister, Betsy. Through her teens and young adulthood, creativity was a defining passion for Sheri, expressed in mostly personal pursuits. Then in May 2014, Betsy asked her to plan her wedding and be her matron of honor. That project fueled Sheri’s energy and creative vision. She not only gave Betsy the wedding of her dreams, she crafted her own dress from her grandmother’s circa 1945 wedding gown, which Sheri and Betsy’s mother had worn as a bride in 1978. She found great joy in repurposing that very special dress, giving new life to a touching piece of family history. Her dress (and the wedding) drew rave reviews. Sheri discovered that she loved crafting fresh fashion from vintage elements. Her next creation was a vintage design she wore for a gala event. Feedback was instantaneous and positive. “Where did you get that dress?” was a question she heard many times that night. By January 2015, Sheri had established her Etsy store presenting up-cycled and re-purposed vintage accessories and dresses. Her business grew enough the first six months that Sheri quit her proverbial “day job” as an account manager in August 2015 and started designing full-time. Today, Sheri fashions stunning collections of contemporary gowns and lingerie crafted from the finest imported silks, tulles, chiffons, and illusion fabrics enhanced by unique, often one-of-a-kind, embellishments. 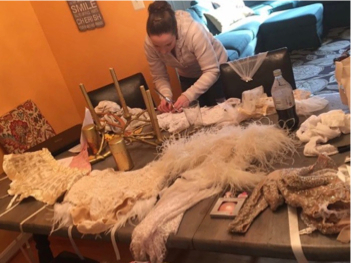 She has been a featured designer for the International Couture Presentation (ICP) and several Washington area bridal expo shows. Her fashions have been featured in More Magazine, Munaluchi Bridal, and Editorial Magazine. Sheri closely follows fashion trends, but she is not eager to be a copy cat. She gets to know her clients, and she develops a keen sense of who they are, what they want, and what makes them happy. Sheri is a tactile designer, inspired by raw materials, fabrics, and unusual embellishments. She gets a jolt of excitement when a special fabric with a unique texture or pattern captures her attention. As a result, Sheri’s studio is a riot of striking fabrics, trims, beaded appliqués, sketches, mannequins, and designs-in-progress – just the way she wants it, all ready and waiting for her next inspiration. Sheri is available to consult, coordinate, and provide her designs for styled photo and video shoots. She’d be happy to discuss the details with you. Love the photos here? So do we! We are thrilled to feature the outstanding photography of Cesar Chavez Photography, Clique Boudoir Photography, and Kevin Marable Photography on this site. Sheri has worked with Cesar, Michelle (of Clique Boudoir), and Kevin on many specialty, fashion, and wedding photo shoots – and in the process has become an ardent admirer of their different styles and informed approach to capturing the essence of their subjects. Thank you all, for your amazing eye, creativity, and dedication to finding the special story of every scene through your lens. You make magic happen!